Excellent day, train travel was the topping on the cake after years of enduring the traffic. Very well organised. Staff on the day were also very accommodating and friendly. Had another wonderful year at this very cheerful Festival. The new marquee layout is very smart and Cheltenham just seems to get bigger and more professional every year. Classic Hospitality is so very accommodating and good natured in all their dealings with us. First time using Classic Hospitality this year will be booking up again next year. Excellent, as always. 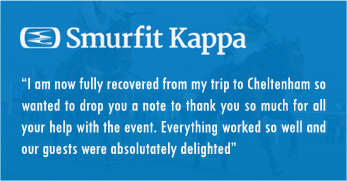 One of my clients commented: 'We had a great day on Friday, thank you so much for the kind invite. The whole setup from pick up to drop off was first class. Thanks again'. An excellent day and very well organised. A great experience. Great hotel,steam train and hospitality. A very good customer service from start to finish. All staff excellent. layout out of marque and village good, food all good except sweet. always love the train! Everyone who attended gave amazing feedback, thank you for your first class organisation. Great day. Steam train was perfect top and tail to the event. 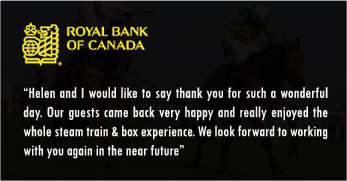 THE FACILITY WAS IDEALLY SITED FOR THE CLIENTS TO ENJOY THE RACING AND THE HOSPITALITY. THE TRAIN WAS AN EXCELLENT "ADD-ON" AND PROVIDED A LITTLE EXTRA WOW FACTOR FOR THE DAY IN ADDITION TO EASING THE TRAVEL AND ACCESS TO THE RACECOURSE. Very efficient service. Any requests were dealt with and we were very well looked after. The event itself was spectacular especially the steam train. Jim Berryman and guest had a most enjoyable day. The best yet. We had a brilliant day and everything was exactly as described in the brochure and in the communications between Classic Hospitality and myself. I will definitely use Classic Hospitality again in the future. Thank you for making my husband's 60th birthday very special. there is nothing better than to combine the steam train and your Cheltenham hospitality packages to make a memorable and successful day. Hugely enjoyable day, beautifully organised. My group enjoyed it very much. Everything was fine. My taste in food is a bit more 'rustic' and perhaps a larger main course and smaller dessert, but that is just my taste. We had a fantastic time, the service was great, and everybody was very helpful and courteous. A pity the punditry wasn't of the same standard!! Grandstand seats fantastic!! Steam train brilliant!!! a fabulous day - all worked like clockwork (although we were slightly too close to missing train back to London) The new facility in the Grandstand with seats was brilliant. Very well run hospitality with a very high caliber of friendly and attentive staff. Well managed in a low key manner hence a 5* overall rating...keep it up. I absolutely love the Steam Train and look forward to this part of the day every year that we go. Always an absolutely delightful experience. Keep up the good work! Wish the journey was longer ! We really enjoyed the overall experience. First class organisation very comfortable and very easy to get into the course. Absolutely brilliant! Really enjoyed the experience. Met some lovely people on the train too. The staff were so helpful and friendly and nothing was ever too much trouble. Would thoroughly recommend it. We now have used the steam train from Toddington to Cheltenham Racecourse for 2 years running for the Gold Cup day. It is a fantastic experience and we have made several friends. We would never consider driving to the event after experiencing this mode of travel. It is so convenient to walk in/out of the Racecourse and to bypass the queues of traffic and parking problems. The atmosphere on the station platform prior to the train journey is fantastic and both the band & staff were first class. Everything is five star, a great day out! Using Classic Hospitality made for a terrific day out with my two sons without the stress of driving/parking at the Racecourse and we would definitely be candidates for a repeat visit next year. David. This is the third time we have used the train and the journey (with champagne!) sets the tone for the day. The service on the train is excellent; good humoured and very efficient and we have recommended this experience to others. We absolutely love it! I would be quite keen on a discount for getting over 25 people but I am not surprised you dont offer it as we will be coming again anyway! The only way to travel to the Races !! Definitely the way to travel to and from the course to avoid the traffic. Drinking champagne on the journey adds to the enjoyment! A Good day out without having to queue to get in or out of car parks. Had a fab day travelling to and from the races on my birthday!!! had a great time, steam train was lovely, staff are amazing and very friendly. would definitely book again if going to the festival. The only way to travel to the Cheltenham Festival. The best bit is on the return journey observing all of the cars queuing to get out of Cheltenham! 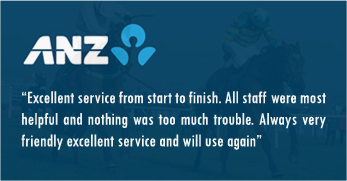 Its a hassle free way to arrive at Cheltenham. Very attentive and friendly staff on train and a real joy to complete the Cheltenham journey by steam. Very good indeed. Will repeat! We had a fantastic day and starting off with an arrival by steam train is just perfect! After years of arriving by road and all the hold-ups and parking issues that brings the steam train entrance is completely stress and irritation free. Marvellous! This is the only way to travel into Cheltenham festival. Great staff at stations. Breakfast at Toddington could be improved but otherwise hard to beat. I've bought Cheltenham Festival steam train tickets for two years now. On both occasions our days out could not have been bettered. Excellent service throughtout thank you all. Very well organised and perfect way to start the day. I only used the Train element not any other Hospitality package so cannot comment on question 3 but everything else was superb and Most enjoyable. I would definitely use this service again. An excellent trouble-free and traffic-free trip to Cheltenham. What could be better. Our guests had a really good time and the fact I ended up being up on the day was an added bonus. One question for next year. Does the Noel Arms over the road have similar/ better accom? Our friends ate there on the second night and said it was excellent. The event was well organised, service from the team on the day was excellent. Well organised, great hosts and we enjoyed it immensely. Couldn't fault a thing with the event, (perhaps other than the weather and a few dodgy results!) Would certainly consider again for next year.. The hospitality package provided was first rate and the enjoyment of the festival is always enhanced by arriving by steam train.In my opinion Classic Hospitality is onto a winner before you even start your day. Everything went smoothly. Arrangements efficient as always. The train was clean and warm (not always the case - esp when the previous owners ran it !!!). Hostesses were top-draw. Great stuff. Excellent day, the experience made better by the steam train arrival and departure. Great day, very wellorganised. Couple of guys who added on to our party last minute said they you could not have been more helpful. That was my experience too - a pleasure to do business with! Fantastic - even the weather was good this year. Very well organised and great atmosphere at Toddington - Well done. We had a wonderful time, thank you, booked accommodation and steam train, everything was well organised and highly enjoyable. 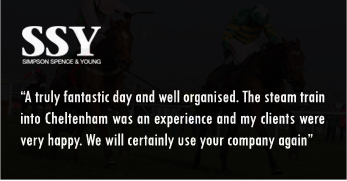 Communication with Classic Hospitality was efficient and friendly - could not have asked for anything more! The rail journey makes the day for us: no queues! As always the GWR staff are charming and attentive and very good at entering into the spirit of things. Overall, an excellent day -out and one we would recommend. I couldn't thank the company enough for their help on the day of our event. We were unsure if we would make the set off time and the staff made arrangements, if this had been the case, that we would still have seats on the next train. Brilliant and so convenient. Just loved skipping the queues. First time user of the service - it was excellent and with the connecting coaches from Moreton now, a complete service for those of us coming from London. Will definitely be looking to use again in the future. Absolutely makes the whole day!!! 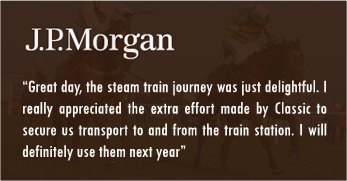 We have used the steam train transfer for 3 years now and its the best way to get to the races. This year we had to change our tickets due to a family bereavement and Classic Hospitality could not have been more helpful. Totally recommended. Service first class, as per usual. The trip was a present from my children. My tickets arrived promptly, and I was met with care and attention by the volunteers at the station. The free parking was another excellent bonus. The other personnel in the station and on the train could not have been more pleasant and helpful. I hope to make the train trip an annual feature from now on. Enjoyed the train ride and made the journey to and from racecourse much more relaxing and stress-free. Fantastic way to travel to the races, stress free and no queues! Very good. Only improvement I would like to see is the option of a later train time on the return journey. I have been meaning to contact you since our steam train experience to let you know how fabulous it was, 3 generations of my family (Mum, Sister & Nieces) had the most wonderful start & end to a great Ladies Day at Cheltenham and will certainly be using this service again as well as highly recommending it to all! Really enjoyable. second time we have done t and enjoyed it immensely. A most enjoyable and practical way of attending Cheltenham Festival. A perfect day.. booking the ATR Steam Train and Cheltenham Festival tickets via telephone was made easy by competent, friendly staff. Steam train was a wonderful combination of excellent hospitality, good company and a very efficient way of getting to and from the racecourse. My friends and I agree that the 'steam train' experience is the perfect start to our day at the Festival Meeting. Fantastic way to visit Cheltenham Festival. Everything about the experience so relaxed. ease of parking , helpful/hardworking staff, nostalgic train journey, no traffic problems. All positives if you want to enjoy your visit to the festival. Will definitly be top of my things to do list when returning to Cheltenham in the future. Very enjoyable and a great way to beat traffic hold ups! brillianlty organised and the steam train takes away all the hassle of getting into the racecourse and adds that extra thrill and excitement. fantastic event, well received by all our guests. Fantastic day was had by all. Train made it very special for all of our team and the clients were amazed and one client was even allowed a picture on the return trip in the engine room. Really enjoyable day - regrettably I met no one from the CH Management Team though. Myself and our clients had a very enjoyable day everything was organised extremely well. 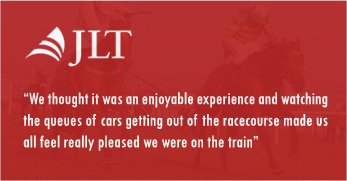 thought it was an enjoyable experience and watching the queues of cars getting out of the racecourse made us all feel really pleased we were on the train. Its the only way to travel to the races. Fantastic experience will definitely book again and will look for other events. Staff very friendly and good service. The staff on the train were excellent! Very good. The sale of champagne or wine by the glass on the train would have neen nice. Great experience and made the day so enjoyable. Fantastic service and atmosphere. Can't wait for next year!!! From the point of booking to leaving the steam train at the end of the day we could not have received better service than that provided by Classic, looking forward to next years festival already. Brilliant service. All of my interactions with Classic Hospitality have been friendly yet professional and efficient. Would definitely recommend this service and company to friends and colleagues. I have already sent a congratulations letter to your company. What a brilliant thing it is can't wait to book for 2014. We really enjoyed our trip on the train, the staff were very welcoming and were pleased to take time to explain the workings of the locomotive and history of the trains. The on train service was excellent, no complaints and we look forward to travelling again next year. Another great trip, seeing the tail lights leaving the racecourse was great. Well done, brilliant, see you next year! 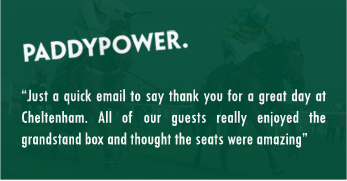 Once again a fantastic way to make the Cheltenham experience even better. Congratulations to Hugh, Dan and the team for the flawless organisation. A wonderful day. Many thanks. Guests thoroughly enjoyed the whole experience. Catering was of an extremely high standard and personalised service was much appreciated. I wouldn't hesitate to thoroughly recommend. Thank you again for a fabulous day. Fantastic experience. I will be booking all four days again next year! Thank you. Great day, the steam train journey was just delightful. I really appreciated the extra effort made by Classic to secure us transport to and from the train station. I will definitely use them next year. Excellent service, food and hospitality, nothing was too much trouble and a great day was had by all, I will be booking for next year. Staff very helpful, nothing too much trouble. All details and instructions received clear and easy to understand. Everybody thoroughly enjoyed the day and want to go again next year. Thank You! I found the steam train journey very enjoyable. The staff on board were friendly and attentive. It certainly made getting in and out of the racecourse very easy. Perfect. Great start and end to the day. Superb way of enjoying a traffic free route to the races and a nice surprise for our clients! Great fun and really enjoyed the whole experience. nice experience and the usual cheltenham atmosphere. staff were most helpful. sad the era seems lost. After trying this once, it's the only way to go to Cheltenham! Excellent service as in previous years. Made the day even more special, would always seek to go to Cheltenham races this way. we thought the whole experience was first class especially the enthusiasm shown by the volunteers on the train! absolutely fantastic. faultless, thank you so much. Stunning. Only way to travel to the Festival. Excellent as usual. The best and most convenient way to Cheltenham - more fun than a helicopter! Had great time. Such a treat to travel on the train and to hold Imperial Commanders Gold Cup!!! Will definitely do it again next year. The steam train was a completely unique experience and it couldnt have been better! Not only was it enjoyable, it was incredibly convenient. What made it even better was passing the queues of traffic getting in and out of the festival whilst drinking a glass of Champagne! A lovely hassle-free way to get to and from the Cheltenham Festival, got the day off to a cracking start!!. Very much appreciated the efforts of the team to get us on the first train so as to attend an early starting corporate function. Great memories. Many thanks to all concerned! Excellent facility.Particularly enjoyed fact the Imperial Commander Gold Cup was there and allowed photos!Only downside was the standard of drinks on offer on train.Gordons GandT not nearly as good -or as potent!-as Marks and Spencers version and in any event should have been chilled! 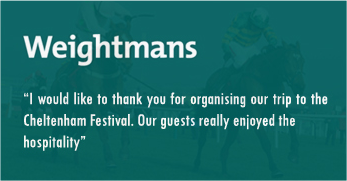 Great experience and perfect for access to the racecourse! Excellent as usual. Hope we are back at Toddington next year for easier parking. Easier access to bacon butties at the station would be good Looking forward to line being extended to Broadway Overall very pleasant experience. a great experience and i would not travel to course by any other way. I would definitely use the steam train again although the facilities provided (cafe etc) at Toddington Station are better than Winchcombe Station although I am aware that the track doesn't currently run to Toddington so there is little that can be done. The steam train was fantastic as ever. There is nothing wrong with Winchcombe station itself its just that Toddington is nearer to where we stay (walking distance) and serves a hot breakfast. It would be nice to return to Toddigton (track problems allowing) but it would not stop me booking in future if this is not possible. The only way to get to & from Cheltenham, always sets up the mood for the day, really enjoyable again!!! Quite apart from the ease with which one arrived at and left the racecourse, the whole experience was a delight. We will most certainly book again and, in the meantime, I am busily recommending the experience to friends. Exceptional day - Well done!!! Will be booking next year Tuesday and Wednesday!! good day everything went well and we got some winners. cant beat it.we were even interviewed for the local rag. Many thanks to everyone at Classic Hospitality. My colleagues and guests had a wonderful day and everything promised was delivered impeccably. Should we look to do this sort of thing again, we would definitely approach Classic Hospitality. 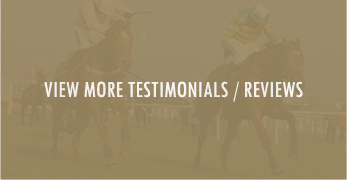 We have travelled on the Steam train to the racecourse 5 times however this was the first time we opted for hospitality and we are so pleased we did, highly recommended - the service was excellent and we wanted for nothing all day. A big thumbs up and we'll definately be back next year! Thanks to all the staff for a great day !! the only thing missing was a couple of winners !! The staff were wonderfully hospitable. 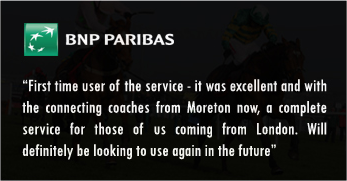 Great service on train and at racecourse. Only small criticism would be that table in marquee was a little cramped. Food could have been served earlier on Tuesday to avoid overlapping with racing. My husband and son were definitely not disappointed with their birthday present . Although accommodation was basic at The Barns Centre , Jo and the staff were excellent. 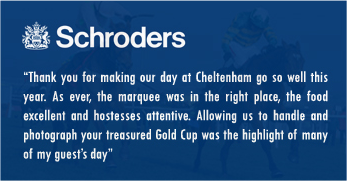 The Steam Train and the hospitality at Cheltenham were first clas they had a great day . We look forward to the day each year and everyone is always so friendly. Once again Classic Hospitality exceeded expectaions of both myself and invited guests all of whom had an excellent day at the races in brilliant surroundings with good food and level of service that would be hard to find in a five star restaurant, the only down side was the lack of selected winners !! Please can we book agin for next year? Best Regards, David Boniface, JSB Print Solutions Ltd.
brilliant day all our clients had a great time, really please with the service on the day, food was good and plenty. would definitely recommend your company. A fantastic day, thankyou for all your efforts, it's an impressive feat of organisation. Loved the train ride in. One very small bit of contructive feedback would be that the food could have been improved upon - beef was well overcooked and spuds under done. Other than that it was seamless - we will be booking again next year! Evereything went like clockwork and the service on the day was first class. Excellent service from start to finish. All staff were most helpful and nothing was too much trouble. Always very friendly excellent service and will use again. I just wanted to say a huge thank you for such a brilliant day last week. Ourselves and more importantly our clients all had a fantastic day, I can't believe a managed to book the sunshine. CEC have been fantastic and a pleasure to deal with in all aspects from our initial calls all the way through to your very attentive waiting staff. I am now fully recovered from my trip to Cheltenham so wanted to drop you a note to thank you so much for all your help with the event. Everything worked so well and our guests were absolutately delighted. Very positive feedback - in fact the only way to travel to Cheltenham. I would also like to pass my thanks onto Dan who was so helpful, the staff on the train and the security people - all of whom were professional, friendly and courteous. They made my life much easier. Again many thanks and look forward to working with you next year. Helen and I would like to say thank you for such a wonderful day on 14 November. Our guests came back very happy and really enjoyed the whole steam train experience. We look forward to working with you again in the near future. 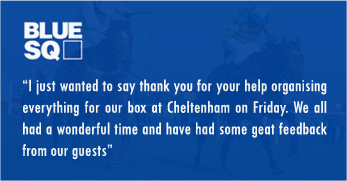 I just wanted to say thank you for your help organising everything for our box at Cheltenham on Friday. We all had a wonderful time and have had some geat feedback from our guests. Please pass my thanks onto Sally-Anne, who was a fantastic help.